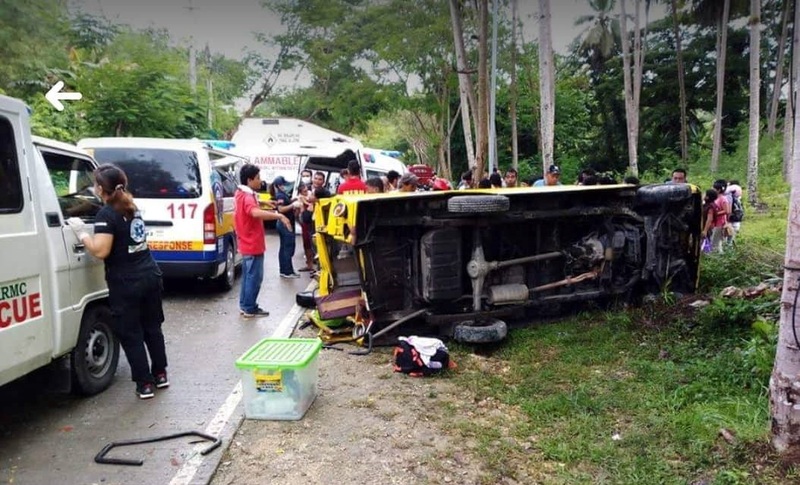 A total of 22 passengers, including an infant and minors aged 1, 2 and 5, were injured and hospitalized after the commuter multicab they were on was accidentally rammed by an oil tanker in Maribojoc on Wednesday. According to PO3 Eugene Morgia of the Maribojoc Police Station, the oil tanker hit the rear end of the multicab causing the commuter vehicle to crash and flip to its side. The oil tanker was trailing the multicab as both vehicles headed towards Tagbilaran City from Loon during the accident, said Morgia. Based on initial police investigation, the oil tanker attempted to overtake the multicab but was forced to return to its lane due to an incoming vehicle at the opposite lane. The oil tanker driver then lost control of the large vehicle causing it to hit the smaller multicab. According to Morgia, all of the victims were rushed to a public hospital but some were later transferred to a private facility. All of the victims were in stable condition as they only suffered minor injuries, said Morgia. Police said that the oil tanker is owned by one Felix Lim while authorities identified its driver as Ramil Batingal.